A massive fire in Cloquet, Minn., in October 1918 left the town in ruins. Dry conditions and embers from the railroad caused the fire. It was the worst natural disaster in the history of Minnesota. Fires, illness, conflicts in foreign lands and distrust of immigrants. Has the United States changed that much between 1918 and 2018? 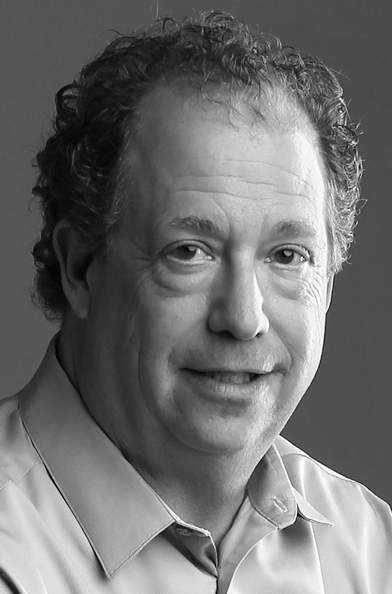 Brown is a 2014 transplant from Minneapolis-St. Paul, where he was a longtime writer for the Minneapolis Star-Tribune. His newest nonfiction book chronicles the trifecta of disasters when World War I, the flu pandemic and massive forest fires converged on northern Minnesota. Through letters, diaries and accounts passed down from immigrants, Brown tells a story of heartache and resiliency. Brown said during his talk at the library, he will also draw links between Minnesota in 1918 and Colorado in 2018. The fires in Minnesota were caused by a combination of drought and embers from a railroad. An official cause of the 416 Fire has not been released, but it did start near the Durango & Silverton Narrow Gauge Railroad tracks. This summer’s 416 Fire burned for a month and was much larger, at 55,000 acres, compared with 8,000 acres in Minnesota. The Minnesota fires were actually a group of smaller blazes in October that grew to combine in force. Unlike in 2018, casualties and damages were massive. Four hundred and fifty-three people were burned to death, 85 were seriously burned and another 2,100 received treatment. The toll on farmers also was high, with 4,295 animals burned, along with 54,083 chickens. As World War I was drawing to its bloody conclusion, mistrust of foreigners – in this case, Germans – also rose to new heights. First-generation Germans in New Ulm and other German communities who asked not to have to fight on the front lines against their cousins and former neighbors were branded as unpatriotic. 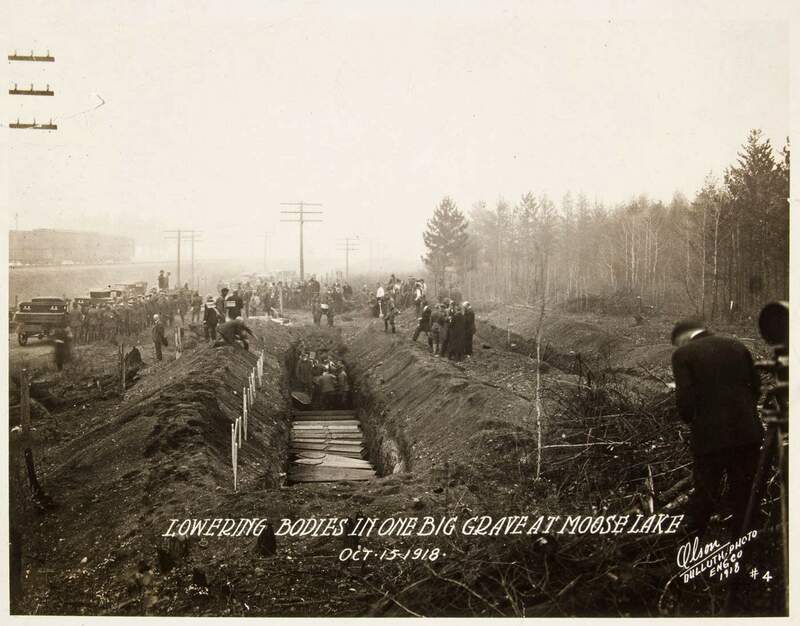 A massive fire in Cloquet, Minn., in October 1918 left the town in ruins. Dry conditions and embers from the railroad caused the fire. It was the worst natural disaster in the history of Minnesota. The Red Cross set up camps throughout northern Minnesota to help fire victims as well as home guardsmen assisting in the efforts. Compounding the misery after the fire was the Spanish flu epidemic, which Brown explains was a misnomer because it likely originated in Kansas. 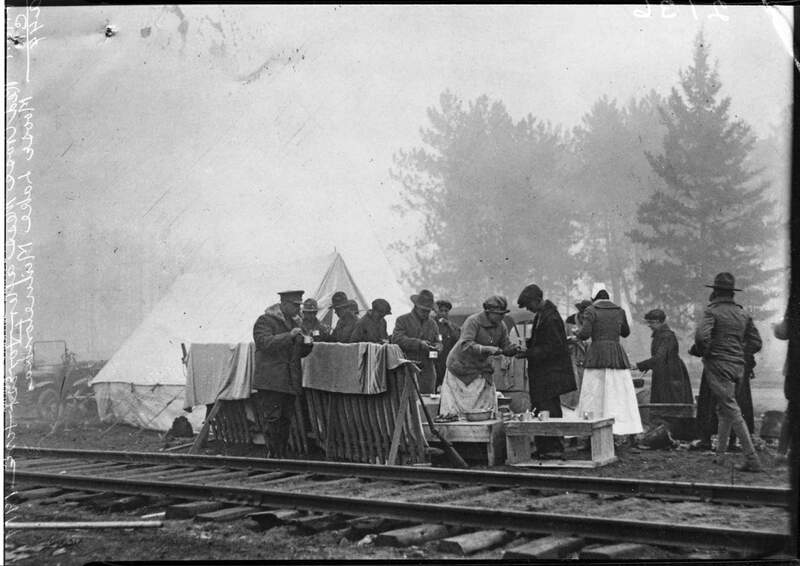 As troops were moved around the country, they spread the flu to military bases or brought it to their hometowns. 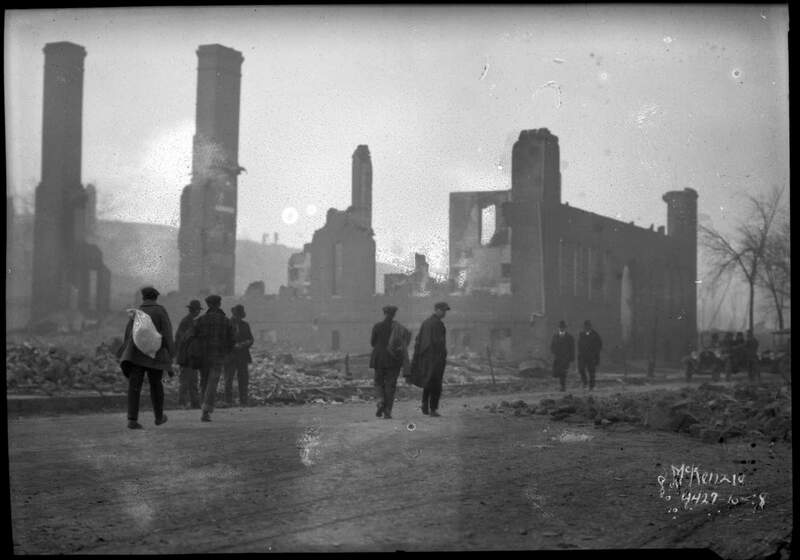 As victims of the fire moved in with relatives or relocated to nearby towns and cities, they were exposed to the virus. At least 106 people died of flu and pneumonia immediately after the fire. “Not much has really changed,” in the past century, Brown said during an interview last week. A flu pandemic is likely to strike again. Brown said that one of the great improvements made since 1918 is how we fight fires. In 1918, firefighting consisted largely of throwing buckets of water on a fire. Keeping the 416 Fire from crossing U.S. Highway 550, with no houses burned and no casualties, was an impressive feat, he said. A massive fire in Cloquet, Minn., on Oct. 12, 1918, left the town in ruins. Those in Minnesota were not so lucky. Brown’s book includes sad tales of families dying in root cellars and basements, trying to escape the flames. John Arvid Kurttu, the postmaster of Automba, got his family evacuated, then stayed behind to collect paperwork and valuables. The fire closed in, and realizing he couldn’t escape, he lied down outside and shot himself in the head. His intact body was found the next day – for some reason, the flames never reached his body. As a historian, Brown has learned that even after a book is completed, “the story doesn’t end.” He receives more photos and stories after a book is published. He’ll discuss five women from 1918 who became his favorite characters. He said it’s easy to write the history of white men, but including the voices of women and other groups is critical. Incredibly, the members of the nearby Ojibwe Tribe on the Fond du Lac Reservation did not suffer any casualties in the blazes, although about 57 homes were burned. Brown also is the author of “So Terrible a Storm: A Tale of Fury on Lake Superior,” which chronicles a massive storm in 1905. Brown said he tried to balance the terrible tragedy of both books with the resiliency and hope demonstrated by the survivors. After moving with his wife, Adele, to Bayfield, Brown joined the Pine River Valley Heritage Society and volunteers at the heritage society museum. Curt Brown will discuss his book, “Minnesota 1918: When Flu, Fire and War Ravaged the State,” from 6 to 7 p.m. Wednesday at the Pine River Library, 395 Bayfield Center Drive, in Bayfield. Copies of the book will be available for sale at the reading or are available online at www.tinyurl.com/MN1918 or www.tinyurl.com/curt-books.